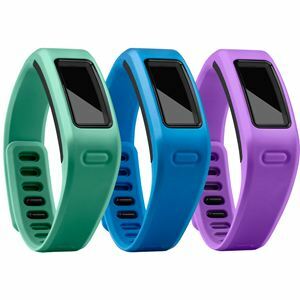 The Garmin VIVOBANDLARGE includes 3 large vivofit wrist bands: Teal, Blue and Purple. Accessorize your lifestyle with this pack of 3 large colored bands. Keep on track and be stylish with these colored bands for your vнvofit. Just remove vнvofit and pop it into a different band for the ultimate personal accessory. The vнvofit band is water-resistant, so you can shower or get caught in the rain, worry-free.